NEW Yellow Portable Tool Shop. Wheel Rolling Metal Cabinet Storage. 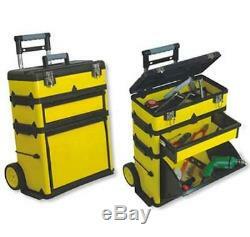 Up for sale is this NEW tool organizer cabinet on wheels. A heavy-duty 26 rolling workshop for maximum storage and easy transportation of tools and materials. Get yours today at this excellent price! Extendable and removable pull handle. Yellow metal exterior for years of durability and protection. Removable upper toolbox for frequently used tools. Side bungee cords for additional storage. Large tilt-out bin for power tools or cabling. Saw horse groove in lid for cutting pipes or lumber. Cord wrap on back of unit. Note: Tools not included--for illustration purposes only. Dimensions: 20 wide x 10 deep x 26 height. Upper (W x D x H) = 18.7" x 8.85" x 3.9. Middle (W x D x H) = 16.14" x 8.07" x 3.74. Lower = Overall Width: 16.34", Depth: 8.66", Front Side Height: 11.62", Back Side Height: 7.68". Any questions, please ask me. I accept Pay Pal for payments. Please contact me if you can not pay through pay pal. If you receive the wrong item, or an item that is damaged, I will make it right with a replacement or return. We pride ourselves in our business and taking care of our customers. We are certain that you will be satisfied with your product and our service. The item "NEW Yellow Portable Tool Shop. Wheel Rolling Metal Cabinet Storage. Workshop" is in sale since Tuesday, October 1, 2013. This item is in the category "Home & Garden\Tools & Workshop Equipment\Tool Boxes & Storage\Tool Boxes". The seller is "high5electronics" and is located in SC. This item can be shipped to United States.